As we’ve seen, metabolism, a defining feature of all life, always involves exchanges with the world outside the organism. Life cannot exist without ingesting matter and excreting waste. The fact that the Earth is a sphere surrounded by a vacuum, and that we have access only to its outer few kilometers, means that the amount of matter available for life to use is finite, and that life’s wastes have nowhere else to go. This permanent recycling regime would be impossible if Earth were a totally closed system — because, as the second law of thermodynamics says, totally closed systems eventually run down. Entropy (disorder) increases until everything comes to a stop. Fortunately for us, while the Earth System is closed to external matter apart from occasional meteorites, it is open to external energy. (2) The constant inflow of light and other radiation from the Sun, combined with the existence of organisms that can convert solar energy into chemical energy, makes endless recycling — and thus all life — possible. All biogeochemical cycles are ultimately powered by photosynthesis. The nineteenth century scientists who discovered the circular metabolic processes that make life possible tended to view them as local or regional. The idea of global metabolism wasn’t even considered until the twentieth century — and even then it was a minority view until almost the twenty-first. The first scientist to undertake a serious study of the dynamic relationship between life and the Earth as a whole was the Russian geochemist Vladimir Ivanovich Vernadsky. Born in 1863 and educated in St. Petersburg, Munich and Paris, by 1900 he was well-known both as a geologist and as a liberal opponent of Tsarist autocracy. A founder of the Constitutional Democratic (Kadet) Party and member of its central committee for many years, he represented the universities’ constituency in the Duma (Parliament) from 1906 to 1911, when he resigned to protest government attacks on academic freedom. In 1915, he founded the Commission for the Study of the Natural Productive Forces of Russia (KEPS), to identify sources of strategic raw materials: its work continued under the Soviet government until 1930. Although he opposed the Bolshevik revolution, he resigned from the Kadets when the party supported military action against the new government. After the Civil War, he returned to Petrograd and resumed his position as head of the Academy of Sciences. In 1922, while studying and teaching in Paris, Vernadsky wrote “A plea for the establishment of a biogeochemical laboratory,” and sent it to scientific bodies in Europe and the United States, hoping to get international funding, but only the Soviet government responded positively. (4) He established his laboratory — really a small research institute — in Leningrad in 1926. He summarized his views in 1926 in the pathbreaking book Biosfera (The Biosphere). Geologists had long recognized the existence of three “envelopes” surrounding the Earth’s crust — atmosphere (air), hydrosphere (water), and lithosphere (soil and rock). The biosphere was a fourth, “a specific, life-saturated envelope of the Earth’s crust,” comprising all living matter on Earth, and all parts of Earth where life exists, from the crust to the upper atmosphere. (6) His argument was revolutionary in two major respects: it treated the entire planet as an object of study, and it identified life itself as a major factor in creating shaping the planet. The radiations that pour upon the Earth cause the biosphere to take on properties unknown to lifeless planetary surfaces, and thus transform the face of the Earth. Activated by radiation, the matter of the biosphere collects and redistributes solar energy, and converts it ultimately into free energy capable of doing work on Earth. The outer layer of the Earth must, therefore, not be considered as a region of matter alone but also as a region of energy and a source of transformation of the planet. To a great extent, exogenous cosmic forces shape the face of the Earth, and as a result, the biosphere differs historically from other parts of the planet. This biosphere plays an extraordinary planetary role. He identified recycling as a central feature of global metabolism. The biosphere’s 1020 to 1021 grams of living matter is incessantly moving, decomposing, and reforming. The chief factor in this process is not growth, but multiplication. New generations, born at intervals ranging from tens of minutes to hundreds of years, renew the substances that have been incorporated into life. Because enormous amounts of living matter are created and decomposed every 24 hours, the quantity which exists at any moment is but an insignificant fraction of the total in a year. In a 1938 article, he described the intimate connection of living organisms with their environments through metabolic processes. Living organisms are connected with the biosphere through their nutrition, breathing, reproduction, metabolism. This connection may be precisely and fully expressed quantitatively by the migration of atoms from the biosphere to the living organism and back again — the biogenic migration of atoms. … There is no natural phenomenon in the biosphere more geologically powerful than life…. Until his death in 1945, Vernadsky and his co-workers conducted cutting-edge research on the composition and dynamics of the biosphere. A recently-translated selection of papers he wrote in that period includes articles on the oxygen and carbon cycles, the organic origins of coal and petroleum, the sources of atmospheric carbon dioxide, and more. I was particularly struck by one that showed that “the Earth’s atmosphere itself, consisting primarily of oxygen, nitrogen, and carbon, is the creation of life.”(11) In these areas and others, Vernadsky’s work was well ahead of science in other countries. He did not, however, adopt the artificial holism that is sometimes invoked as an alternative to dualism. As the research topics listed above show, Vernadsky was fully aware of the need to investigate parts of the biosphere in order to build a picture of the whole. He was certainly aware that many planetary cycles can’t be understood without knowledge of the differing metabolisms of the species involved — for example, his work in the 1930s included consideration of the different planetary impacts of autotrophs (organisms that live by photosynthesis) and heterotrophs (organisms that live by directly or indirectly consuming autotrophs). Above all, he was very aware of the unique biospheric impact of one particular species: homo sapiens. In the 1920s, Vernadsky began to consider whether intelligent matter (humans) might be overwhelming the impact of the rest of living matter. In his 1926 book The Biosphere, he noted that human intelligence had enabled the species to “reach places that are inaccessible to any other living organisms,” which made it difficult to determine what the limits of the biosphere might be. (16) What’s more, humanity was making unprecedented changes in the “film of life” that covers the land. More research into biogeochemical cycles made it evident that economic activity was changing the global metabolism in measurable ways. This passage, from an essay Vernadsky wrote in the 1930s on the carbon cycle, has a very modern feel. The release of carbonic acid [carbon dioxide] by Man in the process of his technical work is considered biogenic, such as the release occurring in factory furnaces, calcinating lime, fermentation, and in many other processes. Is a very interesting and characteristic fact in the history of carbon that the quantity of carbonic acid released by mankind in this way increases with the progress of civilization. It has already reached such an order that it must be taken into account in the geochemical history of the biosphere. In the 1930s, Vernadsky concluded human activity was creating a new planetary envelope that he dubbed the Noösphere (pronounced no-osphere), from nous, the ancient Greek word for mind or intelligence. He borrowed the word from Pierre Teilhard de Chardin, a Jesuit priest and geologist he met in the 1920s in Paris. That borrowing has been a source of confusion, since the two men defined the word in radically differently ways. Teilhard, a Catholic mystic, defined the Noösphere as the spiritual realm that humanity would achieve when it evolved out of the material world, out of the biosphere — the “omega point” where humans would meet Christ. 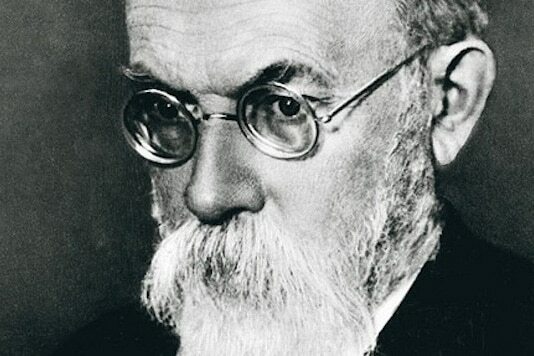 Vernadsky, an atheist and materialist (he called himself a “cosmic realist”) viewed the Noösphere as the part of the Biosphere that was being physically transformed by human activity. So it’s important, when the word appears, to determine which version the writer means, or if the writer is even aware of the deep difference. Vernadsky strongly believed in evolution as an inevitable and progressive advance to a better future, that any negative side-effects caused by the expansion of the Noösphere would be overcome by human intelligence. It was already having positive social effects. Profound social changes, giving support to the broad masses, advanced their interests into the first rank, and the question of eliminating malnutrition and famine, became a realistic option that can no longer be ignored. In one of his last articles, one of the few published in English during his lifetime, he wrote that in modern times, human economic activity was literally changing the chemical composition of the biosphere. He described the Noosphere in terms that sound very like 21st century discussions of the Anthropocene. The Noösphere would be “the last of many stages in the evolution of the biosphere in geological history.” For him, progressive geological evolution and the democratic fight against Nazi barbarism were related. There are obvious parallels between Vernadsky’s view that human activity was transforming the Biosphere into the Noösphere and the current view that human activity has so changed the Earth System that a new geological epoch has begun. His description of humanity’s impact on the biosphere could fit easily into any modern account of the disruption of profound disruption of biogeochemical cycles—in fact, of metabolic rifts. More practically, Vernadsky’s influence on the development of Earth System science was limited because until recently his work was virtually unknown outside of the Soviet Union. When he died, fewer than half a dozen of his articles had been translated into English, and only a handful more into French or German. A full translation of The Biosphere wasn’t published until 1997. Even in the Soviet Union, most of his work was unavailable until the publication of his Selected Works in 1967. In 1970, the influential magazine Scientific American published a special issue on the Biosphere, edited by George Evelyn Hutchinson, a Yale professor who is often called the father of modern ecology. His introductory article provided an overview of biospheric science, incorporating recent advances and fully crediting Vernadsky as originator of the field. He concluded by arguing that Vernadsky’s positive view of the Noösphere is difficult to maintain now that growing environmental crises are threatening the very survival of the Biosphere. Although Vernadsky’s work didn’t directly influence the development of Earth System science, it remains important as an alternative materialist approach to understanding the relationships between life and planet. Seven decades after his death, Vernadsky’s insights into the nature and development of the biosphere can still illuminate our efforts to understand global metabolism—and global metabolic rifts. ↩Barry Commoner, Making Peace With the Planet (New York: New Press, 1992), 10. ↩A physicist would say that the Earth System is closed but not isolated. ↩Kendall E. Bailes, Science and Russian Culture in an Age of Revolutions: V.I. Vernadsky and His Scientific School, 1863-1945 (Bloomington: Indiana University Press, 1990), 167. ↩His proposal was rejected by, among others, the British Association for the Advancement of Science, the U.S. National Research Council, and the Carnegie Institution. ↩Vladimir I. Vernadsky, The Biosphere, Trans. David Langmuir and Mark McMenamin, New York: Springer, 1998 , 91. As Vernadsky pointed out, the Austrian geologist Edward Suess introduced the word biosphere in his popular 1885 textbook The Face of the Earth. ↩Vernadsky, The Biosphere, 59, 44. ↩Jason Ross, ed, 150 Years of Vernadsky, Volume 1: The Biosphere (Leesberg VA: 21st Century Science Associates, 2014), 39, 50. ↩Vladimir I. Vernadsky, Geochemistry and the Biosphere, ed. Frank B. Salisbury, (Santa Fe: Synergetic Press, 2007). ↩Vernadsky, The Biosphere, 51. The science of life has made major advances since Vernadsky’s time, but non-scientific influences remain. ↩Vernadsky to Vernadskaia, May 1913, quoted in Bailes, Science and Russian Culture, 127. Later observers compared the landscape around Sudbury to the surface of the moon. ↩Douglas R. Weiner, Models of Nature: Ecology, Conservation and Cultural Revolution in Soviet Russia (Pittsburgh: University of Pittsburgh Press, 1988), 29. ↩Vernadsky, The Biosphere, 142. Since Vernadsky’s time, it has become clear that living matter exists virtually everywhere on Earth, including in places that humans cannot reach. ↩Vernadsky, Geochemistry and the Biosphere, 185-6. Vernadsky was familiar with Arrhenius’ work on the greenhouse effect, but wasn’t convinced that changes in CO2 levels could have major impacts on climate. ↩Vladimir Vernadsky, “The Transition from the Biosphere to the Noosphere,” Trans. William Jones, 21st Century, Spring-Summer 2012, 27-28. ↩Vernadsky, “The Biosphere and the Noösphere,” American Scientist, January 1945, 9. ↩Vernadsky, Geochemistry and the Biosphere, 221. ↩Clive Hamilton and Jacques Grinevald. “Was the Anthropocene anticipated?” The Anthropocene Review, Vol 2, No. 1, April 2015, 9. I would add that the Noösphere is a region of space, the part of the biosphere changed by humans, while the Anthropocene is the time when human influences are dominant. ↩Jacques Grinevald, “Introduction: The Invisibility of the Vernadskian Revolution.” In Vernadsky, The Biosphere, 27.